The path to a full Chorus Club is revealed, and the super-intense Kurata Shion gets center stage in this month’s chapter of Hashikko Ensemble. Orihara is now a part of the Chorus Club, and Jin needs just one more member and a faculty advisor to get formal “Appreciation Society” status. If he can, he wants someone who plays piano. 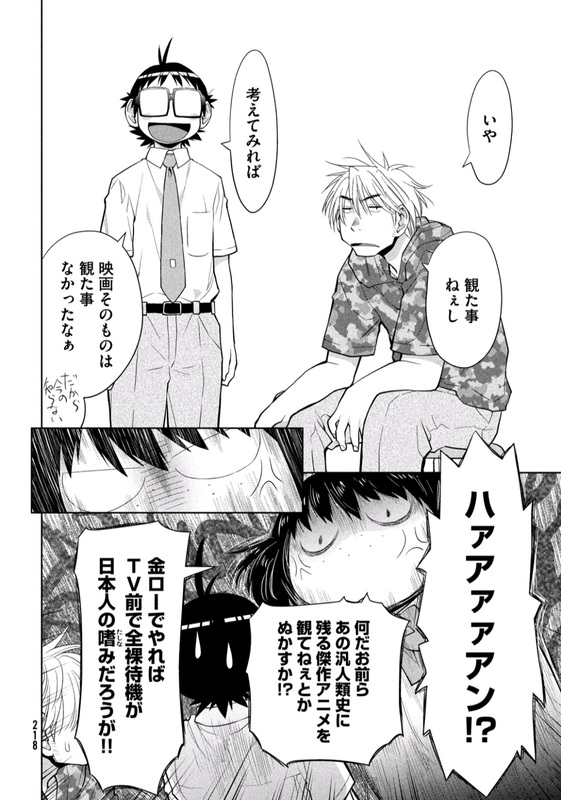 Meanwhile, Kurata is getting advice from Oumi-sensei (the gray-haired one), who suggests that she join the woodworking club to improve her skills and to relax a little. 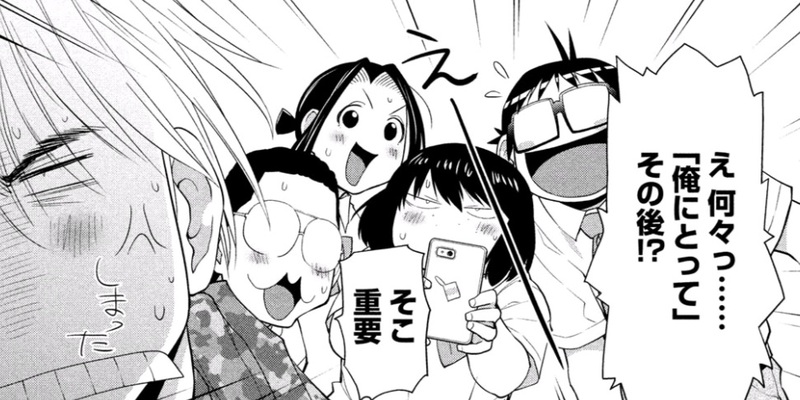 However, the over-serious Kurata (who’s also revealed to be quite the spaz) refuses, seeing it as frivolous fun that gets in the way of Hashimoto Technical’s purpose as a vocational school. Both shy towards her fellow female classmates and frustrated at her lack of talent, she runs away, only to accidentally bump into Akira and the Chorus Club. Curiously, instead of making a typical startled noise, she lets out an F♯2 note. In judo class (apparently a staple of Hashimoto Technical), Kurata is participating along with Hasegawa and her friend. Hasegawa, it turns out, is actually the daughter of a prominent judo family, and tosses around both one of the school’s judo club members and Orihara effortlessly (while also simultaneously ogling the latter). Kurata and Hasegawa’s friend are practicing against each other, but when a sudden pain in Kurata’s hand causes her to fall over, she reveals that her tendonitis is flaring up—as a result of her piano-playing! Kurata doesn’t know how to crack eggs, and can’t seem to even run on a school racetrack without going off-course. If there’s any character she reminds me of, it’s Mio from Nichijou, who can’t seem to follow rules of any kind when it comes to sports or competition. I also love the way they reveal her music background, with her unusually melodic yelp. I might be sounding like a broken record, but Kurata’s the latest in a long line of interesting characters in Hashikko Ensemble. First, there’s the fact that her antagonism towards the Chorus Club is kept mostly to herself—in fact, Jin and Akira don’t even really recognize her. Second, is that her dislike of the Chorus Club had seemed personal on some level, but the hints we get as to why this is the case make her and her story all the more intriguing. It’s clear that Kurata has a musical background of some kind and that it’s limited by her tendonitis. Was a potential piano career derailed by health issues, leading her to lose faith in putting her future in something as fragile as musical performance? Is it perhaps pressure from parents? How much does she actually believe what she’s saying when she declares her preference for the pragmatic, and how much is she forcing herself to think this way? I’m really looking forward to finding out more. As for what she’ll do as a potential Chorus Club member, one would think piano, but the fact that she has trouble playing might mean she’ll be another singer instead. Hasegawa and the other girl who’s always with her (whose name might not even have been mentioned yet) are so different from each other that you wouldn’t necessarily expect them to be close, but they say outright that it’s just a natural product of there being so few girls at the school. From what I can tell, while it likely began out of convenience, it transformed into a genuine friendship at some point. Now, they’re trying to get closer to Kurata too, but she’s as nervous and unsocial as they come. I really enjoy how it doesn’t take much to portray Hasegawa and her friend as fleshed-out characters with an authentic-feeling history. This feeling of realism is one of Kio Shimoku’s greatest strengths. As for Hasegawa’s judo background, I got a good chuckle out of how she actively eggs on the judo club. Also, i wonder if her love of beefy dudes is because of her family or not. No music this chapter, aside from some basic voice lessons. In a flashback, Kurata asks why the Japanese shorthand for “smartphone” is sumaho and not sumafo, as if it doesn’t make sense. I AGREE. IT’S ALWAYS BOTHERED ME. Orihara’s hard to understand, but it might not be for the reasons anyone assumed. It’s the Sports Festival at Hashimoto Technical High School, but the biggest spectacle isn’t any event—it’s Orihara on a rampage. Another classmate has played a prank on him by messing with his music player, so Orihara responds by going berserk and tossing him around like a ragdoll. Jin and the others suspect that the only thing that can calm him down is his music and his noise-canceling earphones, but (as revealed in a flashback), they’ve been having trouble fixing the earphones, even with Himari’s help. However, Himari reveals that she’s spent extra time to repair them. In a mad dash, the Chorus Club and the Rugby Club work together to successfully subdue Orihara. As Orihara listens to his music player and falls unconscious, he remembers the parental abuse he and his little brother suffered as children. He remembers hearing screaming, but can’t remember if it was his or his brother’s voice. But as the police came to take away his mom and her boyfriend, he remembers thinking it was his brother’s. In fact, Orihara can still hear his brother’s voice today. This chapter kind of reminds me of the infamous soccer episode of the anime Eureka Seven, which contained, in the same episode, both athletic filler hijinks and a plot-crucial coup d’etat. The situation in Hashikko Ensemble isn’t quite the same, as what happens at the Sports Festival contributes directly to the main story, but the contrast is potent. The general wackiness of this chapter makes the dramatic reveal of Orihara’s situation much more impactful. As comedic as Hashikko Ensemble can be, I really don’t think this reveal is an absolute tonal shift for the manga. There’s a recurring theme of among the characters of trying to deal with the emotional and physical setbacks of their pasts, and it even creeps through in Jin’s vague descriptions about his relationship with his dad. Orihara’s story seems to be the most serious by far, and I have faith that it’ll be executed well. I mean, this is the guy who wrote Ogiue from Genshiken‘s story, after all. The exact circumstances of Orihara and his little brother’s abuse is kept vague. The manga mentions that his little brother was unable to move, and the arrival of the cops clearly implies that this was not the result of illness or accidental injury. It’s unclear if the abuse was primarily physical, emotional, sexual, or any combination, and I don’t have any hypotheses at this moment. More information will likely be revealed to us over time, but the degree to which Kio holds back will be interesting to see. Whatever the case might be, the chapter is a crucial piece of the puzzle that is Orihara. He’s not just a loner, and he’s not just temperamental—his past is complicated, and having him open up to others (let alone join a club) is going to be about understanding his issues. Himari works hard to restore Orihara’s earphones, but I don’t get the sense that she’s doing this out of either sympathy for the guy, or out of a desire to uphold her end of the deal with Akira and Jin. She seems to me like someone who either values the technical skills needed or who has a sense of pride in her own abilities—like it’s a challenge she wants to overcome. Nothing says this more than her pantomiming the hand motions necessary to make the complicated earphone repairs. In that respect, she might make a good team with Jin, whose audio expertise potentially supplements her own strengths. His explanation of the complexities of noise-canceling earphones (like how you need to get through the urethane coating that’s meant to prevent short-circuits before you can even begin to fix them) is a perfect example in this regard. What Orihara’s been listening to this whole time is Gabriel Fauré’s “Requiem Op.48: In Paradisum.” It’s used in Catholic church funerals, which probably means that Orihara’s little brother didn’t make it. There’s a brief mention at the beginning that Hashimoto Technical High School switch to holding their Sports Festivals on weekdays because in the old days, delinquents from rival schools would come over to pick fights on the weekends. While the culture has changed since then, they keep the scheduling. 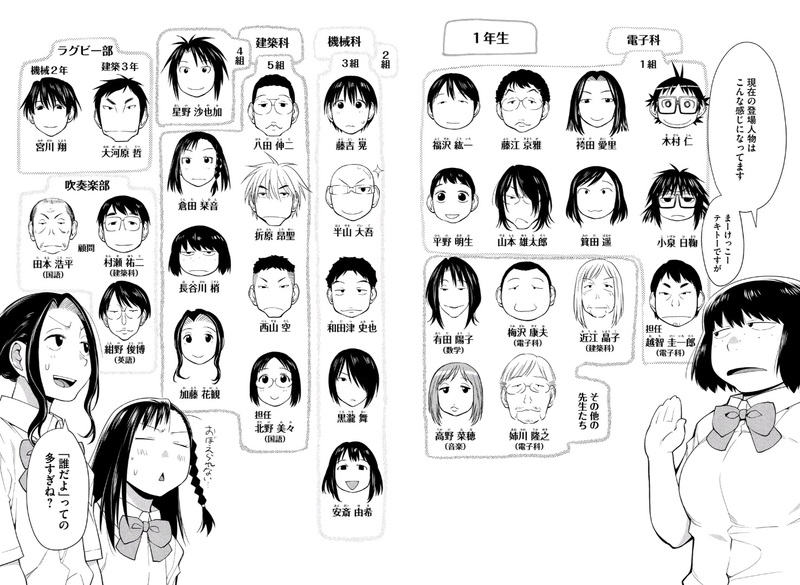 Just having this little hint at the yesteryear of the high school (as well as the fact that the one older female teacher still remembers those days) gives this funny sense of history to the school setting of Hashikko Ensemble. Also, Hasegawa is excellent as always. I can’t help but laugh every time I see her now. Love is in the air! …Or wait, that feeling might actually be “guilt.” It’s a chance to learn about Koizumi Himari in Hashikko Ensemble! 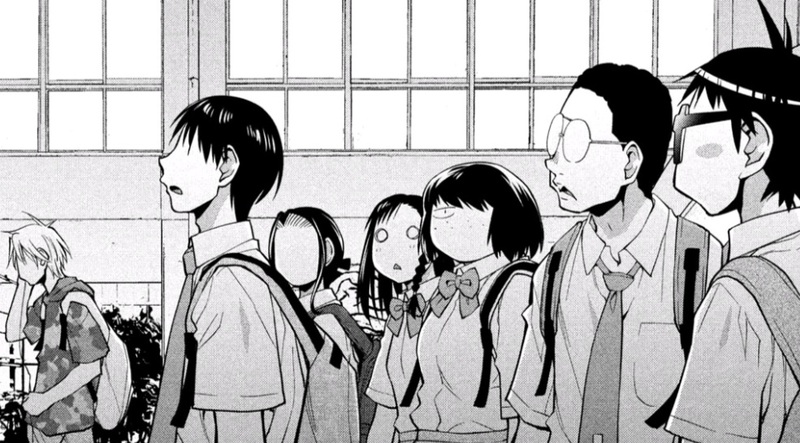 Having heard Akira’s deal—if we repair your earphones, you’ll have to join the Chorus Club—Orihara responds with disgust and tries to take a swing. Jin blocks Orihara’s fist, inadvertently breaking his finger (but not seeming terribly bothered by it). Jin wants to fix the earphones regardless of any deal, but he can’t find anyone in class who’s up to the task. Some days later, however, Himari (Akira’s next-door neighbor) is actually in school for the first time in a while, and she turns out to be (for reasons unknown) a deft hand at soldering. Jin, who’s in the same class as Himari, tries to convince her to help repair the earphones, but she hesitates. After some conversation, mostly revolving around how she hates Akira’s puberty-induced ultra-bass voice, Jin convinces Himari to a deal: if he can show the appeal of Akira’s new voice through song, she’ll help them out. As the latest character to join the main cast, Himari is a major part of Chapter 8. Frankly, I think she’s fantastic, but awkward, surly girls drawn by Kio Shimoku are my aesthetic. I find that she bounces off all of the other characters quite well, and it makes me look forward to future interactions involving her. Himari blushes a lot, but it can be hard to tell what exactly it means at any given moment. Because she seems to have a non-stop chip on her shoulder on top of being socially standoffish, her red face seems to shift from displaying embarrassment towards herself, embarrassment towards others, and maybe some feelings for Akira himself. Based on the brief glimpses of her memories, she appears to treasure her childhood with Akira—though she appears at first glance to not be especially different personality-wise back then. One aspect of her that intrigues me is her proclivity for five-fingered discounts. It’s such an expected personality trait that she’s instantly memorable in my eyes. Also, I get the feeling that her talents in this area are related to her adeptness with a soldering iron. Something she does outside of class might make her a dexterous girl in more ways than one. 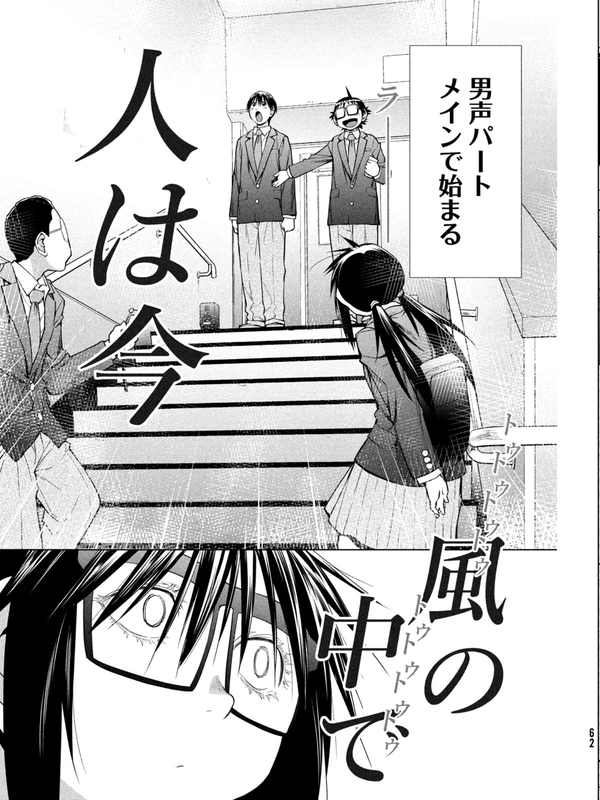 While it’s in a stairwell instead of a hall, and the audience is one childhood friend instead of an audience of many, this chapter’s performance is a huge step for Akira. We may not be seeing every single step of Akira’s development, but it’s clear that Jin’s training has been paying off. The pacing of his progress feels right. Two previous songs are mentioned this month, specifically because Himari forbade Jin and Akira from singing them: “Believe” and “Kanade.” The song they do pick is1982’s “Tooi Hi no Uta” [Song of a Far-Off Day] by Iwasawa Chihaya. The song is actually based on Johann Pachelbel’s Canon, with Japanese lyrics added. This is more a personal note, but when Himari pulls out the resistors she swiped, I recognized them from a digital engineering class I took back in high school. Their authenticity makes me feel that Kio is putting his best foot forward researching all aspects for Hashikko Ensemble. Next chapter is going to focus on the school sports festival, and I’m curious to see how this shakes out at a technical high school. How much of mechanics and engineering is brain and how much of it is brawn? Whatever the case may be, it’s implied that something crazy is going to happen.